We want to start by offering a huge congrats to each of our runners – Lorraine Reynolds, Brenda Reynolds, James Davis, Daniel Friedman, and Sandra Borzomi – for your training and fundraising efforts. After months of preparation, they not only successfully completed the race, they were able to surpass our $7,500 fundraising goal and raise $8,400+ for our financial assistance program. That means more than 12 families battling cancer can receive emotional and financial relief from the burden of daily expenses like mortgage, rent, and utility bills. Though our runners have crossed the finish line, their fundraising efforts are still running strong. It’s not too late to support our cause with a financial contribution. You can visit the Team JAF NYC Half Marathon donation page until the end of the month to make a donation of any amount online. Dedicated, diligent, courageous, strong, and positive are just some of the words we use to describe our incredible Team JAF runners. 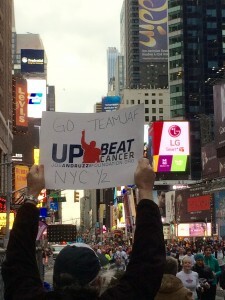 The effort of our runners inspires the Joe Andruzzi Foundation to push further as we work to (Up)Beat Cancer – each and every day. Joe grew up on Staten Island and holds the city of New York close to his heart, and we’re thrilled to have participated in such a great cause. And let’s not forget about our fantastic supporters who joined us on the sidelines to cheer on our team and give them the energy they needed to finish strong. 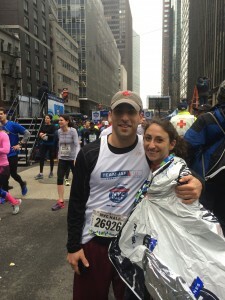 We would also like to thank New Balance for providing Team JAF with their NYC Half Marathon Singlets! On behalf of everyone here at the Joe Andruzzi Foundation, thank you for your hard work and support. We look forward to seeing you all in 34 days in for the 2015 Boston Marathon.